It's finally spring! 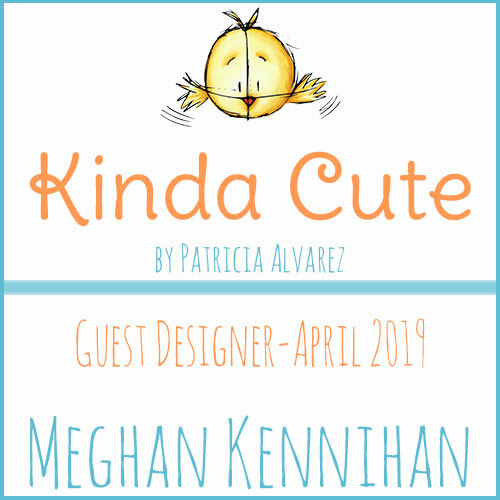 So I'm bringing you a fabulous spring project you can make and give as a little gift to the book lovers in your life. 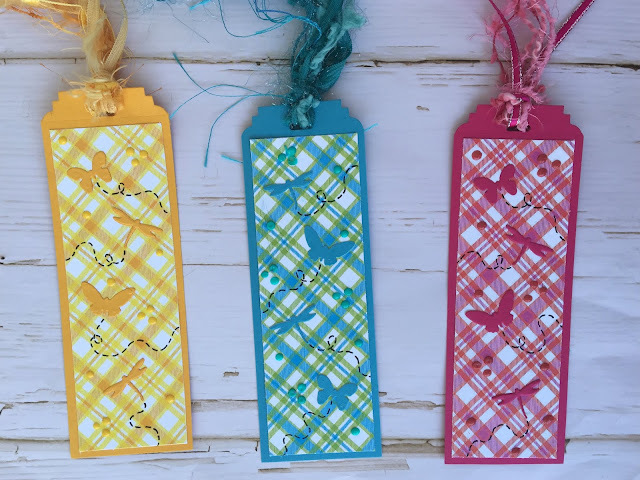 These bookmarks are SOOOO easy to make and bright they will make anyone smile. 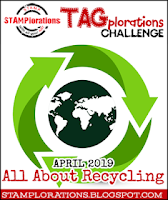 I actually used RECYCLED cardstock from old scrapbook packets so that I could join Stamplorations Tagplorations challenge this month Recycling! Q: Do you like to read? What is your favorite book? I started by cutting out a 2 inch by 6.5 inch rectangle from each of the three colors. 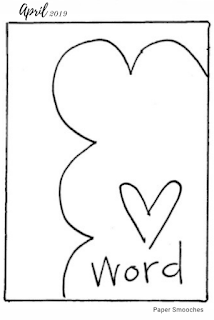 You can make your bookmarks as long as you want but I thought that was a perfect size. 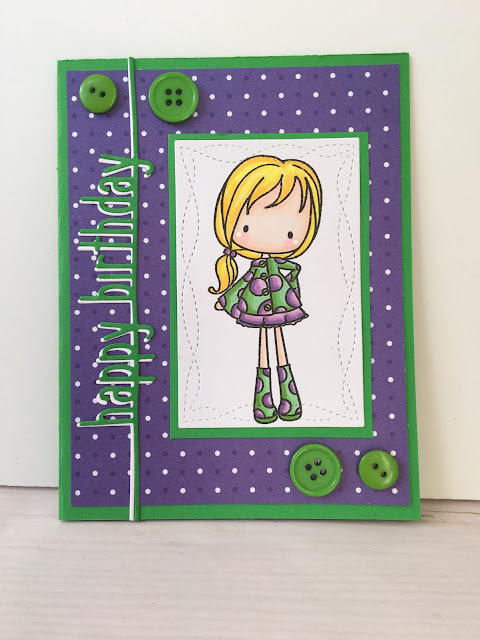 I used the Stamp Doctor 2 Inch Tag Topper: Tag Topper #3 and ran it through my die cut machine to make the bookmark top. Next I cut out 1.75 inch by 6 inch rectangles out of each of the plaid papers from the ADORABLE Bright Paper Pack Easter #1. I glued them together and added the Stamp Doctor tiny butterflies and dragonflies. I finished them off with Nuvo drops and Adornaments ribbons and fiber. Which one is your favorite? 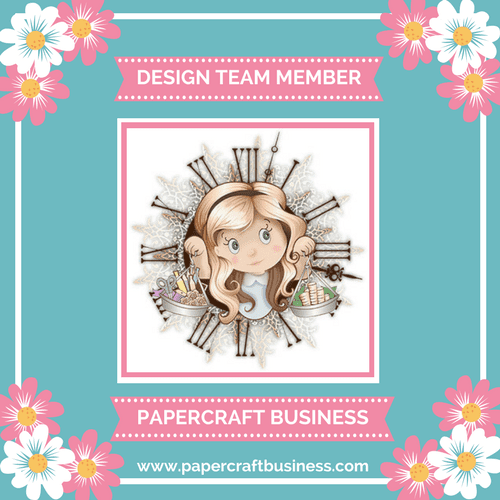 Click the link below to get these awesome diecuts and SAVE 10% using CODE: madebymeghank at checkout! And don't forget to follow me on Instagram HERE! It's Your Birthday...Get Your Happy On! Sharing a fun birthday card for a Coffee Loving Friend! 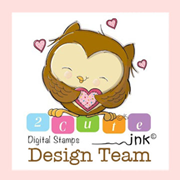 This cutie is a digital stamp from C.C Designers Facebook Page. It's a FREEBIE! I think she is darling. The fun mug is from Paper Smooches. 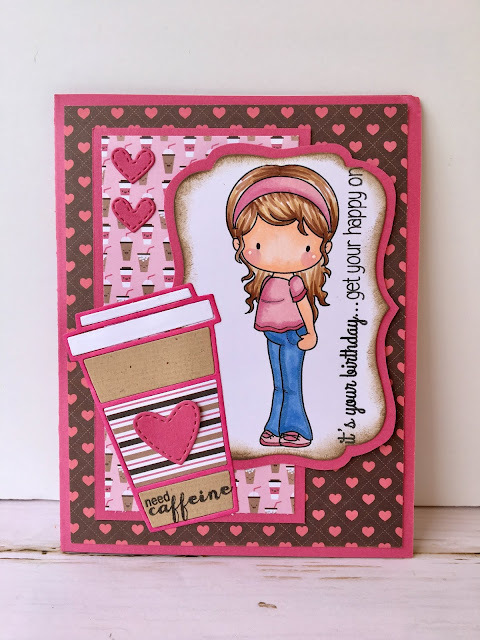 I had so much fun paper piecing together this coffee cup and card using all the Crazy for Coffee papers from the Your Next Stamp Paper Pack. I used the Paper Smooches April Sketch as inspiration for my design. Q: Are you a Dark Roast, Medium Roast, or Light Roast person? A: Me? Dark Roast all the way! I used Stamploration Nesting Dies called Curly Labels/Tags to die cut out my copic colored image. I inked the edges with Ground Espresso Distress Oxide Ink. I then die cut the cup and glued the pieces down on card. 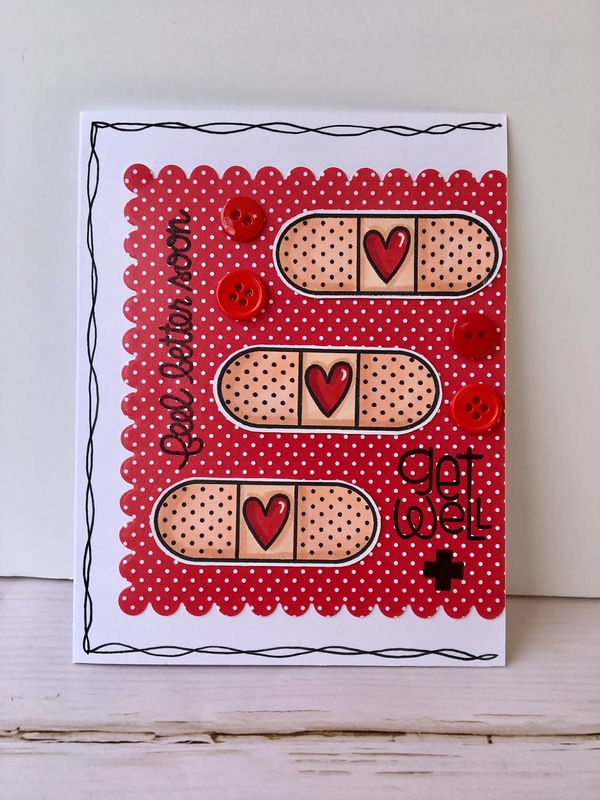 I finished my card with the Birthday Sentiment from Casual Fri-Days and some die-cut hearts. 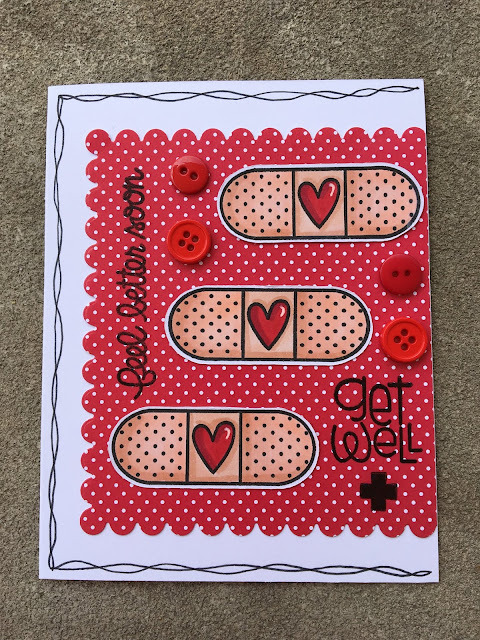 It's always good to have some Get Well cards on hand since you never know when something is going to come up. 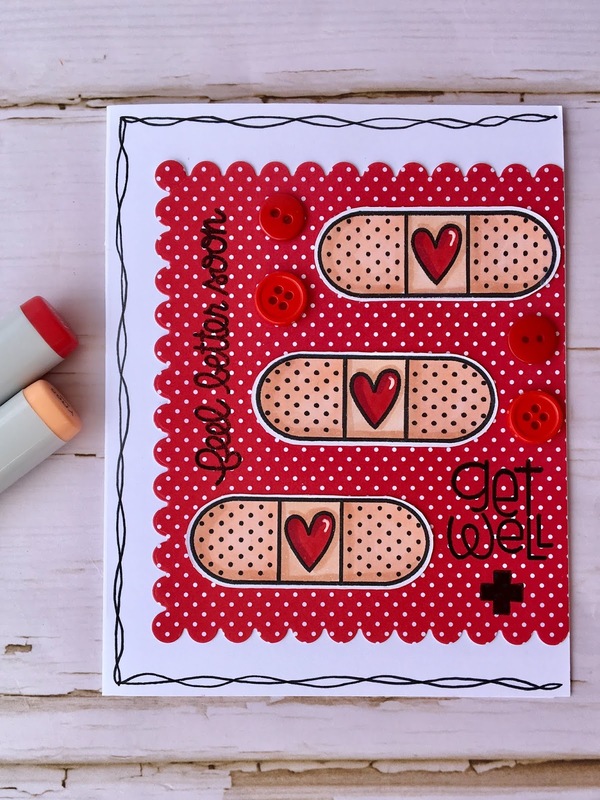 I love this Healthy Vibes stamp set from Paper Smooches it just puts a smile on my face. Even though I don't want anyone to ever get sick or hurt, I know this will definitely will make them feel better. 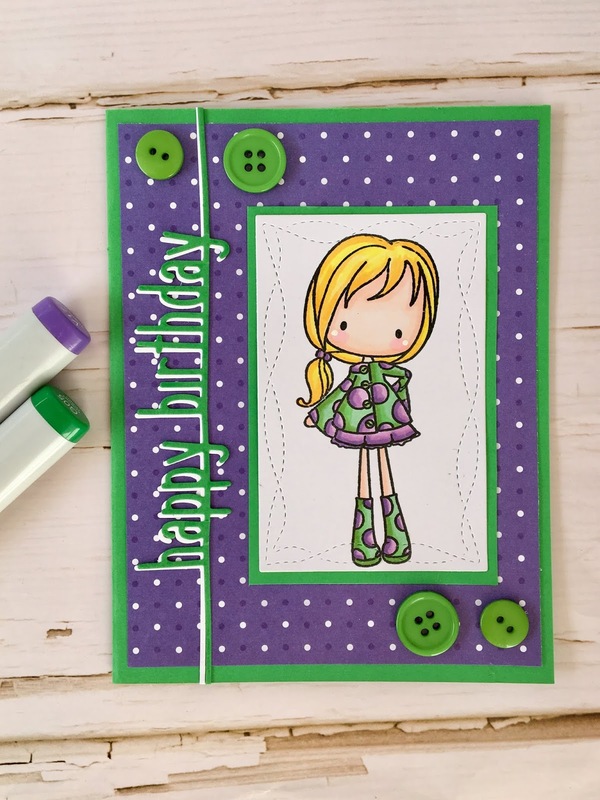 I used this month's Paper Smooches April Challenge Sketch for my design. Q: What is the longest time you have ever been sick or hurt? I colored the band-aids with copic markers. I drew the little doodle around the edges and added the cute little buttons to accent my card. 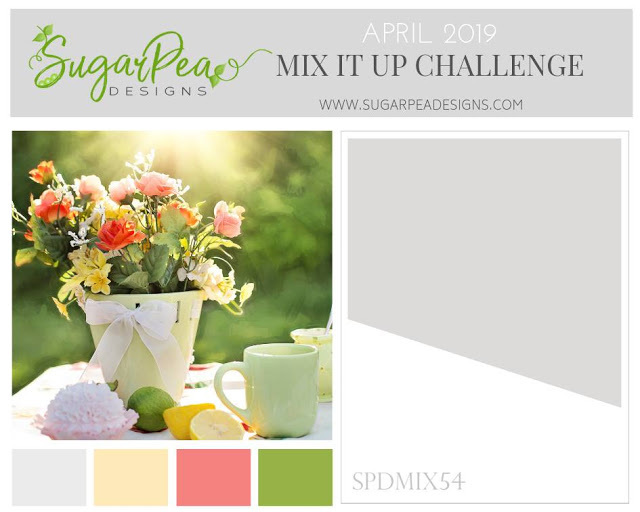 I wanted to join the Mix It Up Challenge #54 by Sugar Pea Designs this month. I love the sketch because I got to do two scenes, a night sky and a radiant sunshine. 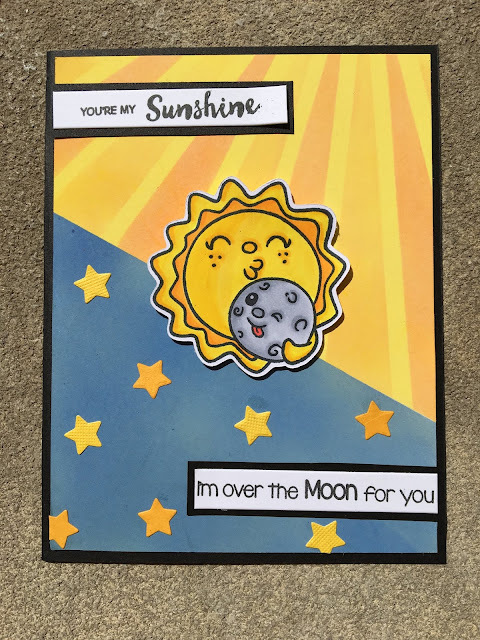 I used two of the colors from the other side (yellow & grey). I think this is the perfect card for a mom or a dad to a daughter or son. Q: Are you a night or morning person? I mask off one part of my panel and stenciled on the rays with Squeezed Lemon and Wild Honey Distress Oxide Inks. Then I blended various blue Distress Oxides for the night sky. 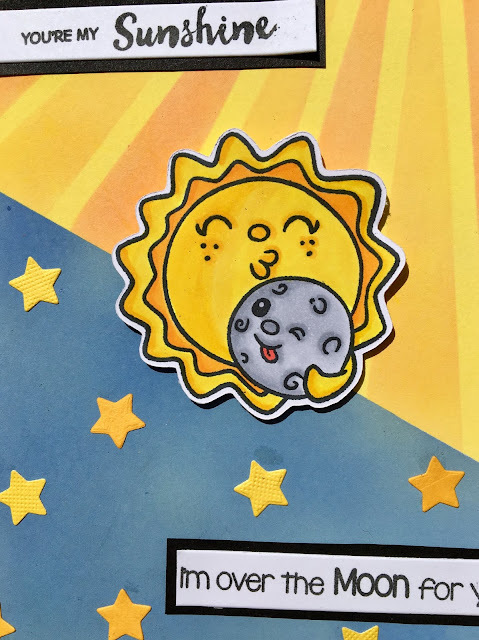 I colored my Sun and Moon with Copic Markers and I placed it in the center with foam tape to make it pop from the card. 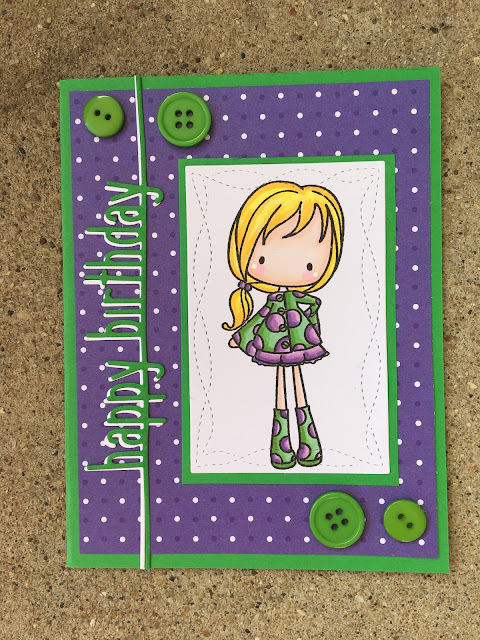 I finished my card by taping my panel to a black card base and by adding the little diecut stars. I also matted the sentiments in black. Thank you for stopping by! 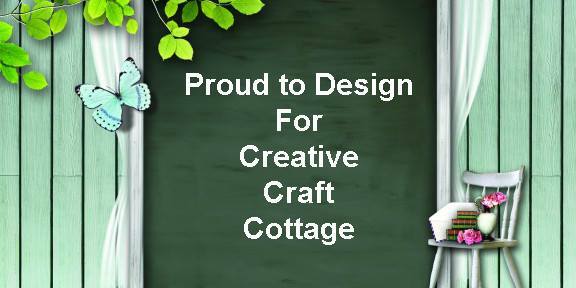 Please click follow and leave a comment answering my Make Crafty Friends Q & A on all my posts! HAPPY EASTER!! 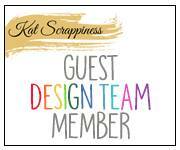 So excited to be Guest Designing for Doodle Paper Playground again! I made a FUN little Easter Shaker card for you today using the brand new EASTER Basket Blend! 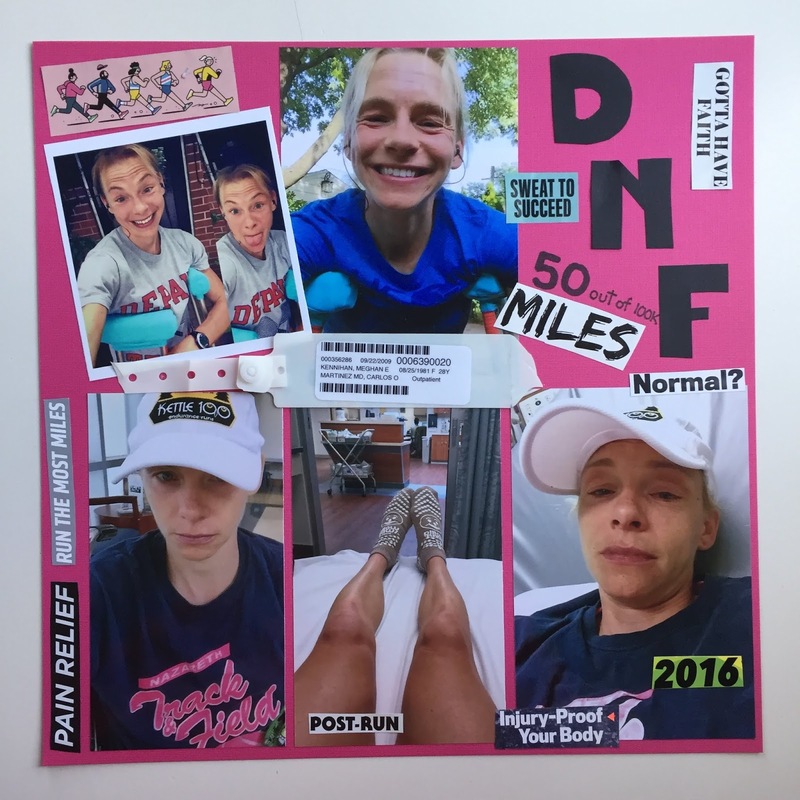 Have you seen the April Release? 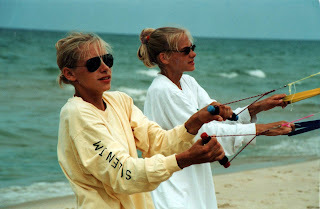 Check it out here and join the hop! There is still time to win! 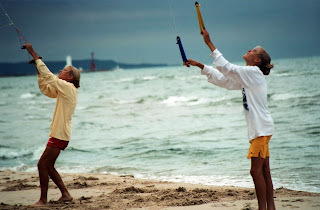 I made this KITE flying card because my family is a KITE FLYING family... we each own probably 5+ Stunt Kites that we used to fly every summer in Pentwater, Michigan. We would "dance" with them to music and do all kinds of amazing tricks! 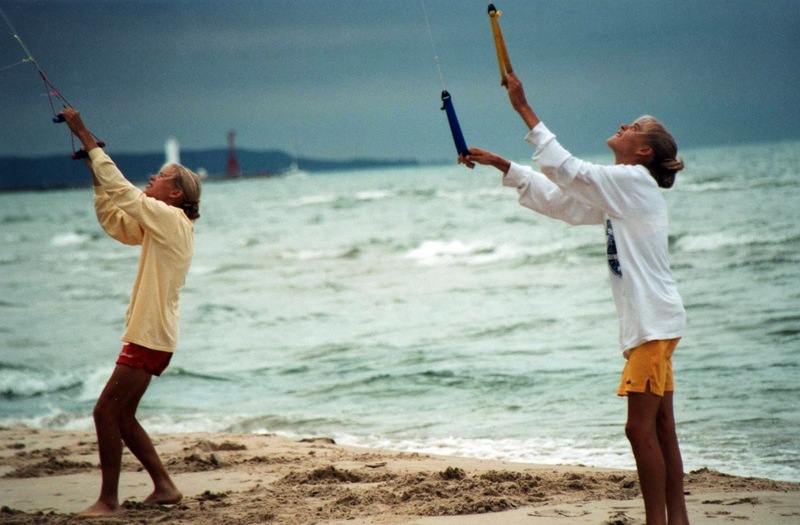 Bet you didn't know there was such a thing as stunt kite competitions! I included some old pics for you of us at the beach! Q: What is your typical Easter Breakfast or Brunch? A: Me? Growing up we always had "Favorite Eggs" (think creamed eggs on toast) too hard to explain see recipe here. I created my panel by using a Darice embossing template and inking it with Tumbled Glass Distress Oxide ink. Then I handcut the diamond shape for the kite. I added the blend and put it on my base. 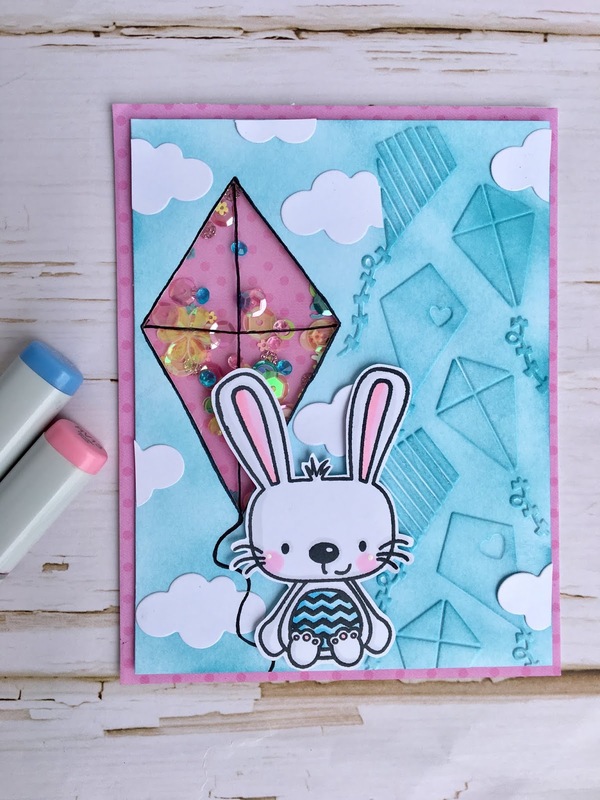 I finished my card by adding the cute little bunny and diecut clouds. 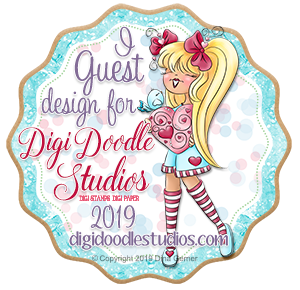 Thank you so much for having me Doodles Paper Playground! 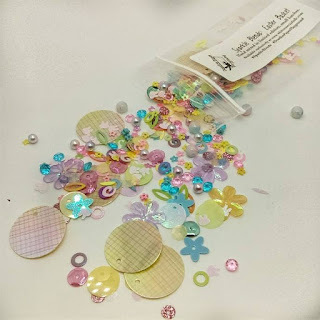 Please follow my blog here and answer my Make Crafty Friends Q & A in every post! Follow me on Instagram here! 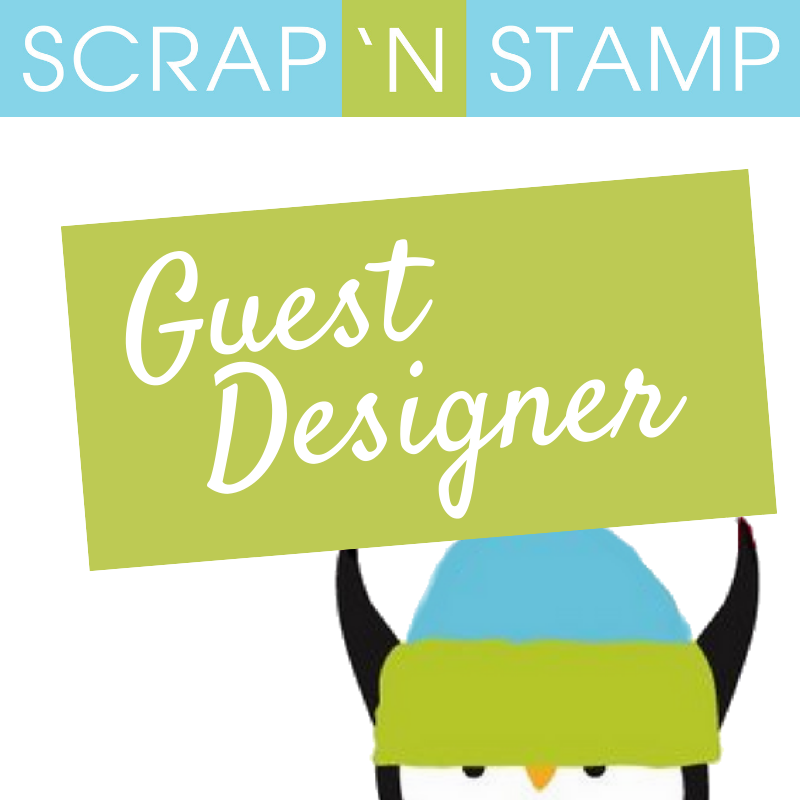 I have been dying to use this stamp! 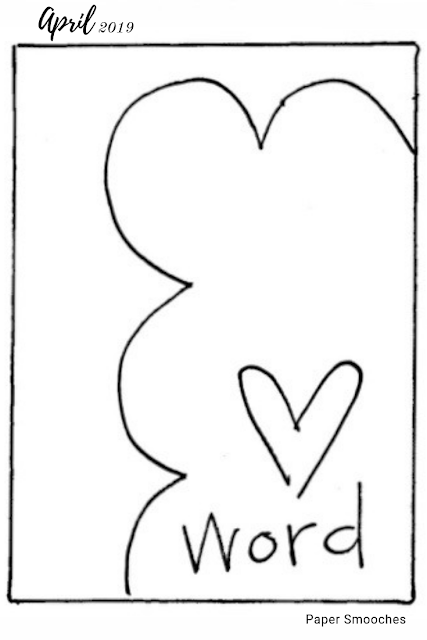 I bought it around Valentine's Day and intended to color it up for Valentine's Day but never got around to it. 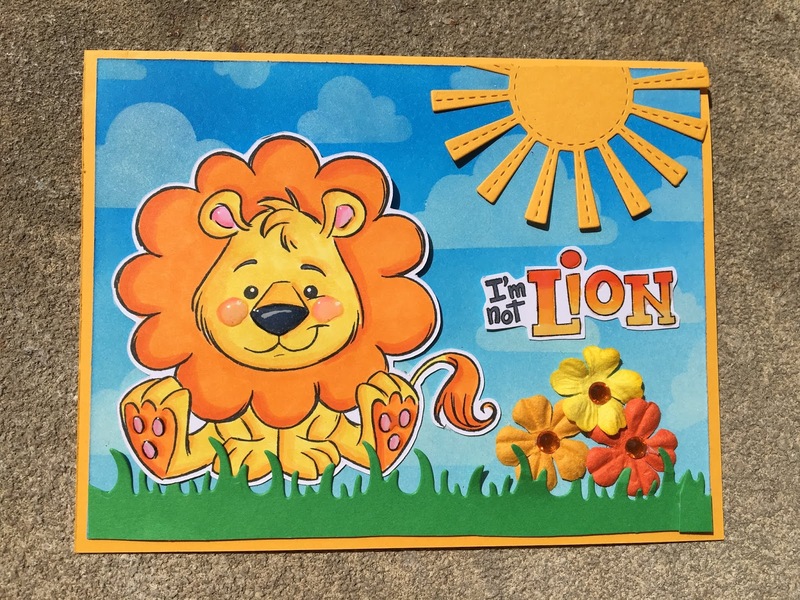 So when I saw the Spring Challenge that Whimsy Stamps had for this month I knew I had to make it work for spring. The theme is "April showers bring May flowers". 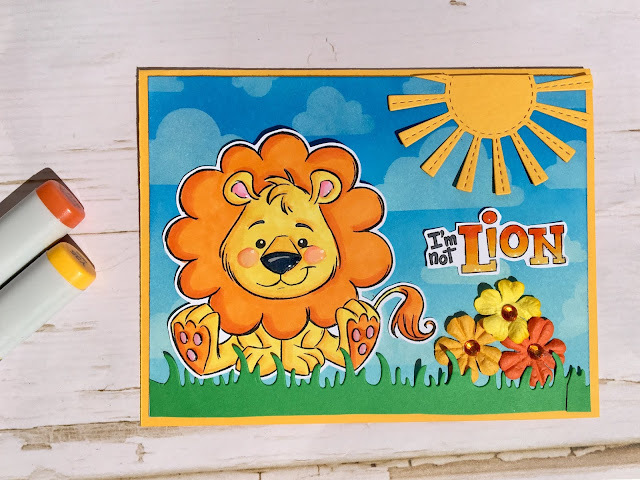 So I colored this darling lion up and put him in a perfect spring scene with sunshine, clouds, grass, and FLOWERS! Out like a LION and in like a LAMB. 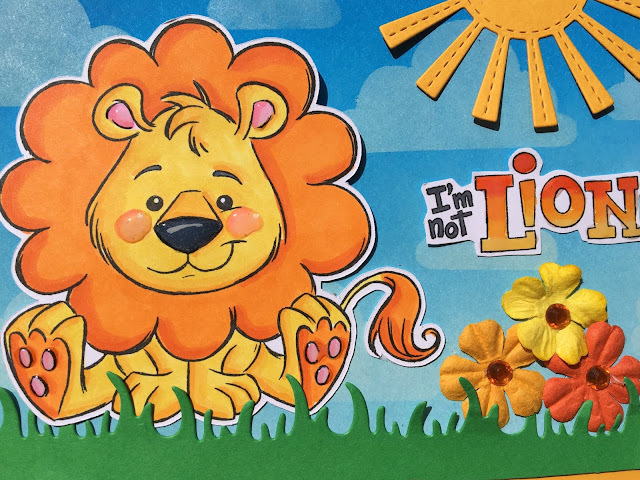 Q: Have you ever seen a real lion? Zoo? Safari? A: Me? I have only seen them in the Zoo but my twin sister went on Semester at Sea and saw on in Africa, in the wild! EEK! 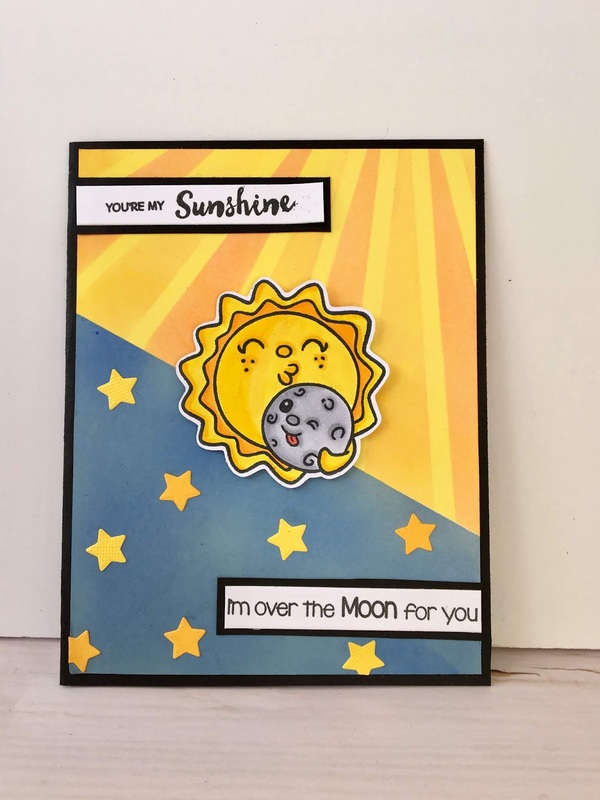 I created the background using Distress Ink Oxide Blending and white ink for the clouds using a stencil from Craftin' Desert Divas. I die cut the grass and sunshine, then added the matching flowers and gems. 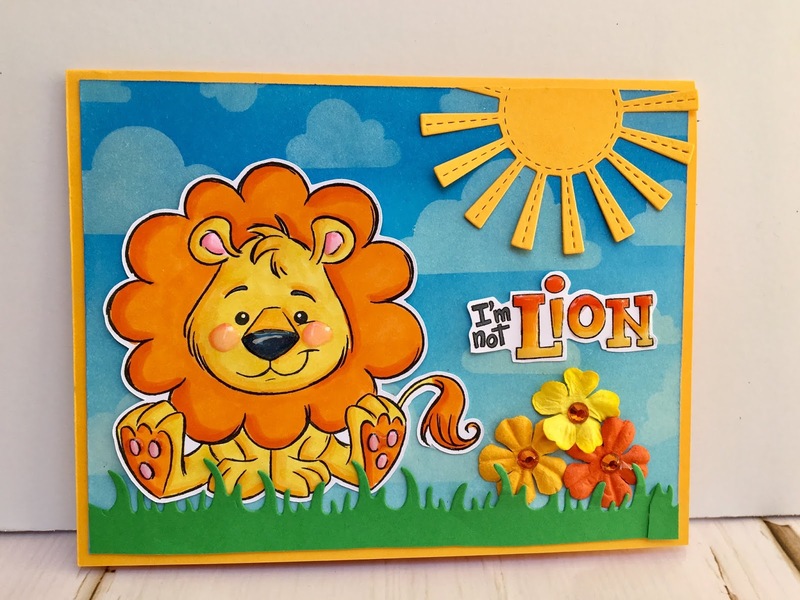 I finished my card by accenting the cheeks, ears, toes, and word "Lion" with glossy accents. Just dropping in to share a cute little birthday card I made using Spring Pinkies from C.C Designs. I love this little lady. Her hair and outfit are just soooo cute. Q: What color hair do you color the most when making your cards? I colored her up with copics and diecut her out using my wavy line rectangle die from Gina Marie Designs. Then I die cut the Happy Birthday from white and green paper and glued them together to look shadowed. 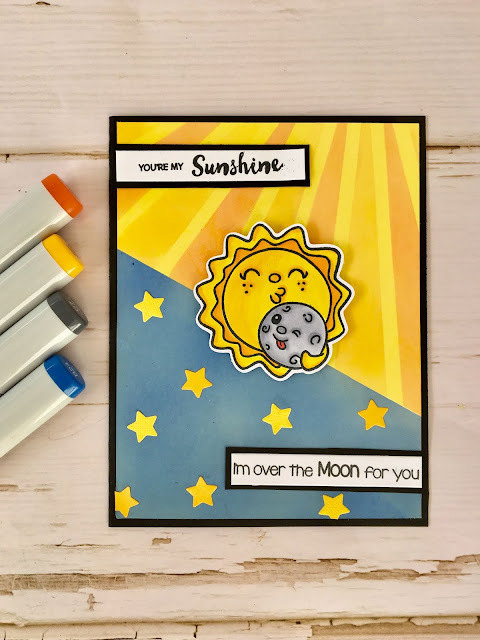 I finished my card with some cute little buttons!